Spacing has been adjusted to obtain Zo. 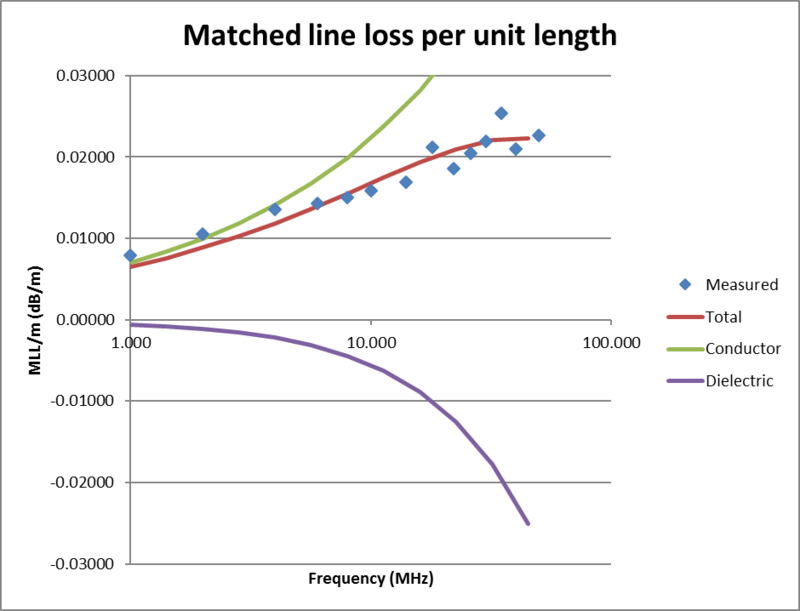 At 2MHz MLL of a copper line is 0.121dB as against 0.32dB measured for the stranded CCS line. At 50MHz there is little difference, the CCS line is copper like in its measured loss. The difference is almost certainly attributable to CCS and stranding. The copper cladding on the very thin strands is way less than skin depth at lower frequencies, effective RF resistance is higher than that of a solid copper conductor. You might regard that the difference is tenths of a dB and insignificant, but this line is almost always used at high VSWR and the difference between the two lines is likely to be significant. But is the measured data credible? Such a model is usually a good fit for practical transmission lines were skin effect is well developed, and dielectric loss is proportional to frequency. 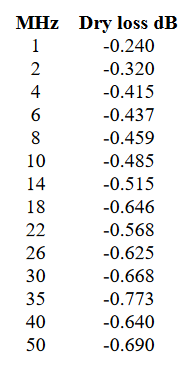 A solution for k1 and k2 for least squares error has been found for the DXE published data. Above is a plot of the measured data and the model. The issue that arises in that the value for k2 is significantly negative, and we ought to expect it is positive and smaller than k2 at these frequencies. We might expect and excuse some departure from the model at frequencies below 5MHz due to the copper clad steel conductors. 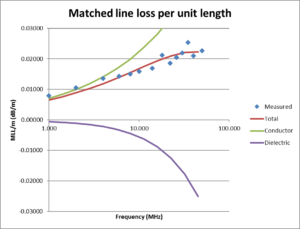 If we compare loss at 30MHz to 10MHz, we would expect it to increase by a factor of 3^0.5=1.73 but it increases by 1.37. This is well above frequencies where CCS effects would show, and well below frequencies where dielectric loss is significant, so it is somewhat surprising that the measured ratio departs so much. So, the poor fit raises some questions about the validity of the measurement data.